The climate of the Sonoran Desert, especially at Organ Pipe Cactus National Monument, is unique in comparison to other deserts. Organ Pipe Cactus National Monument’s globally significant ecosystem provides habitat for many varieties of plants and animals, including threatened and endangered species. In addition to this flora and fauna, numerous cultures have also made a home within this ecosystem over the course of thousands of years. In order to survive in this area, each adapts to the region’s seasonal and long-term climate changes. This essay addresses the climatic transformation through time, rainfall, temperature, as well as the amount of air pollution known as deposition and visibility of air quality. The Sonoran Desert, home to Organ Pipe Cactus National Monument, would not have been classified as a desert in the past. About eleven thousand years ago the continental ice cap receded toward the pole, causing temperatures in Arizona and Mexico to rise. As this area’s temperature warmed, tropical plants and global storm tracks shifted northward. The Sonoran emerged in this warmer tropical area, and the plant life which has become symbolic of desert life such as cacti and trees, including the mesquites, paloverdes, and ironwood, evolved from tropical relatives. During this time, Organ Pipe’s location was wetter and cooler than today, which allowed for relative plants to thrive. As the glaciers retreated, some of the fauna shifted also, while other varieties of plant life merely adapted and became part of the desert known today. recordkeeping began in 1943.”  Organ Pipe is the only North American desert that receives two rainy seasons a year. Winter rains are widespread, occurring from December to March and are steady, gentle, and come from the west. Whereas summer rains are more localized and originate from the east and south. These rains start in mid-July or August when – clouds build up for several weeks with moisture pulled from the Gulf of Mexico or the Pacific Ocean. The Ajo Mountains on the eastern edge of the park include the highest peak in the park, Mt. Ajo (4,808 ft.), and are the first sizable barrier to the air flow sweeping off the Gulf of California. Because of this, the rainfall is more likely to occur where this moist air is first forced upward, along the west flank of the Ajo Mountains. This mountainous eastern area of the park receives more rainfall than the more desert-like western portion of the park. The Ajo Mountains average thirteen and one-half inches a year, in comparison to the Bates Mountains, sixteen hundred feet lower and ten miles to the west, which average seven and one-half. Meanwhile, the visitor center which is a little over five miles south-west of the Ajo range averages nine and three-quarters inches per year, with roughly half that coming in summer and half in winter. The early months of the summer are some of the hottest in the Organ Pipe area with temperatures often rising above 110 degrees Fahrenheit. There is very low humidity in this desert climate, normally below ten percent. Because of this, those visiting the park perspire and cool themselves efficiently. Organ Pipe is often so dry that evaporation often occurs without precipitation. The evaporation in Organ Pipe has been known to exceed ten feet of standing water a year. Organ Pipe’s current drought, one of its worst in history, stems partly from temperature changes. 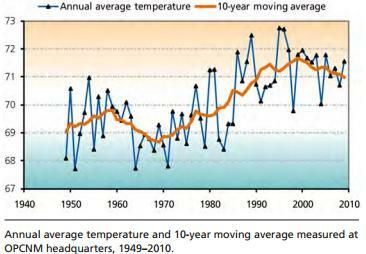 Since 1949, the average temperature has varied widely from year to year, but overall it has increased by 2 degrees. This increase holds true for all seasons and also includes overnight lows and daily highs. The most recent data collected in 2010 shows the average annual temperature was 70. 5° F.
A component of temperature not often taken into consideration when looking into the climate of a desert is the cold and often freezing weather. Since climatic recordkeeping began in 1949, the annual average number of days with freezing temperatures is 14.1. But, the most recent numbers of 2010 show that Organ Pipe experienced merely two days with freezing temperatures during this year. Again, one explanation for this is the increase in temperature which the park is experiencing. This absence of days below freezing affects plants and animals as well as other components and features of the monument. A final feature of the climate of Organ Pipe Cactus National Monument is the deposition and visibility of the air quality. Airborne pollution can fall to the ground in precipitation, in dust, or simply due to gravity. This type of pollution is called air deposition. Since the discontinuation of copper mining and smelting in the region in 1980, sulfate concentrations have decreased. On the other hand, nitrogen levels have increased, becoming a significant concern in the park; both of these issues are related to the deposition aspect of air quality. A second issue of concern in the park is visibility (how far and well one can see). Both local and distant air pollution sources affect air quality in Organ Pipe, and although the visibility at the monument is superior to other areas in the country, it is still of concern to park managers. According to the 2010 Superintendent Report, “Visibility impairment results largely from small particles in the atmosphere; small pollutant particles in the air scatter and absorb light, causing haze and reducing visibility. As light extinction increases, visibility decreases”. The Sonoran Desert and Organ Pipe Cactus National Monument have both evolved greatly throughout time, changing from a tropical climate to a desert climate. As the ecosystem changed so too did other climatic features of the monument. The rainfall, temperature, and air quality are all key items to the climate of this area and each one put together makes Organ Pipe what it is today. Bill Broyles, Organ Pipe Cactus National Monument: Where Edges Meet (Tucson: Southwest Parks and Monuments Association, 1996), 11. U.S. Department of the Interior, “Organ Pipe Cactus National Monument: Superintendent’s 2010 Report of Natural Resources and Vital Signs, 2011,” http://www.nps.gov/orpi/naturescience/upload/orpi_vitalsigns2010.pdf (accessed March 28, 2012), 7. Carol Ann Bassett, Organ Pipe: Life on the Edge, 8. U.S. Department of the Interior, “Organ Pipe Cactus National Monument: Superintendent’s 2010 Report of Natural Resources and Vital Signs, 2011,” 7. Bill Broyles, Organ Pipe Cactus National Monument: Where Edges Meet, 56. Richard S. Felger and Bill Broyles, Dry Borders: Great Natural Reserves of the Sonoran Desert (Salt Lake City: The University of Utah Press, 2007), 43. Bill Broyles, Organ Pipe Cactus National Monument: Where Edges Meet, 26. U.S. Department of the Interior, “Organ Pipe Cactus National Monument: Superintendent’s 2010 Report of Natural Resources and Vital Signs, 2011,” 8. U.S. Department of the Interior, “Organ Pipe Cactus National Monument: Superintendent’s 2010 Report of Natural Resources and Vital Signs, 2011,” 9.